As retailers, you have to keep finding new ways of connecting to your customers. With the onset of fierce competition from the e-commerce industry, physical retail store owners need more innovative and effective marketing tools in order to compete. Irrespective of the size and type of the store, the retailers are today feeling the heat of brutal competition in the market. And that’s exactly why Digital Displays are so important right now. First of all, what are Digital Displays? A Digital Display is just what its name suggests. It’s a screen or a signage displaying ads, tutorials, videos, messages or anything else that retailers would want their customers to watch. Technically speaking, a digital display is basically a flat panel screen that shows multimedia content to the viewers. The content displayed on the screen is actually facilitated by different technologies and softwares. While Digital Displays are available in both LCD and LED; LED is more ideal and commonly preferred because of its crystal-clear picture, greater potential and proven trustworthiness. The content displayed on LED boasts of deep saturated colours with a wide colour gamut and absolutely no screen gaps or image retention issues. LED screens are much better at energy efficiency, user friendliness, design flexibility, outdoor performance, and screen brightness as compared to the LCD options. There are 3 digital displays which can be used for retail advertising- LED Displays, Digital Signage, and Digital Way-finding. The LED Displays have different options in LED screens- Ultra Slim LED Display, Small pitch LED Display, Transparent LED Displays, LED Facades and many more. The displays are available in different sizes and resolutions. The selection of size and resolution is done on the basis of distance between the viewer and the display’s final location. These wide range of options helps accommodate specific requirements of various retailers. How Can Retailers use Digital Displays? The advanced technology and numerous options, the applicability of Digital Displays for Retails is huge. It can be used indoors for creating an unforgettable first impression, outdoors to attract attention and increase the footfall inside your store, or it can even be used to help customers navigate and reach your destination without any hassle. Other examples of creative usage are Window Displays, Storytelling, Tutorials, Product information, Testimonials, Interactive tools etc. 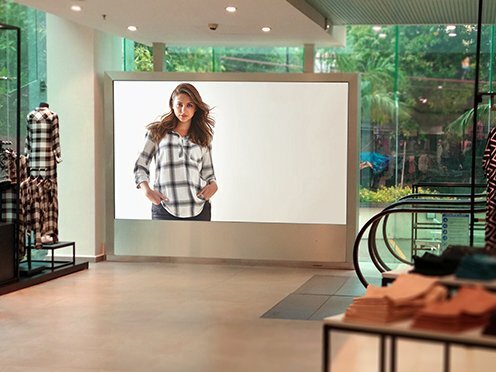 Why should Retailers use Digital Displays? The very attractive and clearly visible digital displays are very hard to miss. The features like colour correction and screen brightness makes it even more noticeable to naked eyes. Appropriate positioning of such screens can boost your customer traffic exponentially. At the end of the day, the customers will buy what they unforgettably notice. The use of Digital Displays will directly lead to increase in your sales. The screens are also available in various options as per your requirements and budget. There’s no denying that this is not just another marketing expense, in fact it’s an investment with huge returns. With the help of Digital Way-finding screens, the retailers no more have to worry about not being found in huge malls and markets. The very effective and efficient technology of these tools will lead your customers directly at your doorstep. With the latest technology used for Digital Displays, there is no scope of irregularities or errors. You can also very conveniently change information like prices, features or any of the content regardless of the number of screens in a location or the distance between them. The accuracy and easy content-management features of this next generation tech further makes it the game changer in the field of retail marketing. The creative use of digital signage and LED displays can also increase customer interaction and eventually increase your sales. Displaying tools where customers can scroll through your products or look for other common answers can bring customers closer to your brand and enhance their shopping experience. So, what are you waiting for? Order the Digital Displays for your retail store now, sit back, and just enjoy the increase in customer traffic and sales.